In stock -This product will ship today if ordered within the next 12 hours and 11 minutes. Especially formulated for women in the menopause years, this formula provides a potent blend of traditional Chinese herbs with vitamins and minerals. Menophase includes ginseng, a herb chosen to help maintain a feeling of vitality. Utilising a rich blend of vitamins, minerals, herbs and other active ingredients, Menophase may help support women beyond child bearing years. Menophase is designed to support the women`s health in later life. This unique formulation combines potent extracts of well-known traditional Chinese and European herbs recognized for supporting and maintaining female health. Magnesium citrate, vegetarian capsule: hypromellose, sage leaf 5:1 extract (anti-caking agent: silicon dioxide), natural vitamin E, Hesperidin complex, vitamin C (as magnesium ascorbate), Siberian Ginseng, schizandra berry extract 5:1, niacin (as nicotinamide), zinc citrate, vitamin B6 (as pyridoxal-5-phosphate, pyridoxine hydrochloride), hops powder, flow agent: magnesium stearate (vegetarian source), anti-caking agent: silicon dioxide. Menopausal women should take 2 vegicaps a day, with a main meal, or as your health professional advises. A daily multi vitamin and True Food Soyagen or Higher Nature True Food SuperPotency Soyagen is also recommended. Not advisable if pregnant, breastfeeding or taking Warfarin. Below are reviews of Higher Nature Menophase - 30 Vegicaps by bodykind customers. If you have tried this product we'd love to hear what you think so please leave a review. Really helps with my perimenopausal problems including dizziness, nausea and breast tenderness which were becoming debilitating. I have tried a lot of natural remedies for the menopause to alleviate hot flushes, night sweats and fatigue and this is the only product which seems to help. I stopped taking them for six weeks and tried alternatives and my symptoms worsened again. I couldn't wait for my order to arrive! 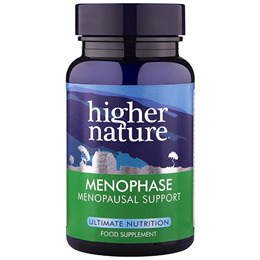 Higher Nature Menophase is especially formulated for women in the menopause years. This formula provides a potent blend of traditional Chinese herbs with vitamins and minerals and includes ginseng, chosen to help maintain a feeling of vitality.